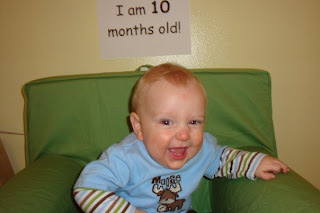 I can't believe Noah is now 10 months! It seems like he is more of a "big boy"...if a 10 month old can even be called that...these past few weeks. He is very good with his cruising, I think he will walk soon. Once he begins walking he won't be a little baby anymore! Where did this past year go? One of Noah's new favorite things is this CD Clint's aunt gave us. It's a Disney CD and the first song is "I'll be coming 'round the mountain". It has Mickey and Goofy signing and every time I put it on Noah looks around to see if they are here! He gets confused that it's just a song and not the characters here like in Disney World. It's cute. He starts bouncing up and down and his eyes get really wide! It's the cutest thing! Thankfully, I'm not sick of the song...yet. In time I suppose! Wow... 10 months! He's getting so big and he is SOO cute! I can't believe how big he's gotten!! Those cheeks are so cute!